Can I attach a television mount using custom drilled holes? I have a 94" wall with 14" studs. There is a stud right in the center at 47". I have been looking for a full motion mount wide enough, so that I can use the studs on both sides of the center. Meaning I'd need at least 28" of mount capability. So far I have only been able to find mounts that will work on 16", and 24" studs. The full motion mount I purchased has 26" of mounting surface, but because my studs are 14" centers, I will only be able to use one of the pre-drilled holes. The TV is a 70" LED, that weighs 86lbs. Can I put the Full motion mount I have up, drill a new hole in the center, and use the farthest hole on one side? Would it then be safe to have the Arm assembly approximately in the center of the mount, in order to get the TV back to center? In this configuration, the arm assembly would not be in the center of both sets of bolts securing the mount to the studs it would be about inline, possibly a little bit outside of the new holes I would be drilling in the center of the wall plate. [Wall] (https://us-mg6.mail.yahoo.com/ya/download?mid=2_0_0_1_1432559_AJXrHkgAABz1UwOIKAAAAHr7oVI&pid=1&fid=Inbox&inline=1) [wall plate with markings] (https://us-mg6.mail.yahoo.com/ya/download?mid=2_0_0_1_1433284_AG%2FuHkgAAB0wUwOIXgAAAClJwZI&pid=1&fid=Inbox&inline=1) The green tape marks my studs, I would be using the existing hole farthest to the right and drilling one in center, the arm would need to be positioned approximately in the center of the frame. 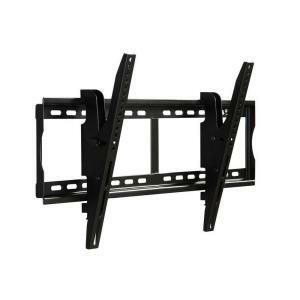 The vast majority of TV mounts have multiple slots across their face to provide a range of choices for mounting bolts. Decent ones are fairly cheap and I would recommend getting one that gives you some choices on positioning support. If you must use the one you have, drilling two holes in a solid area of the mount should not compromise the unit. You should definitely put two lag bolts in studs on the top and two on the bottom. Mounts are designed to allow the TV to be positioned anywhere along the track, even fully to one side. the force of the TV on the mount is mostly shear force, pulling straight down. Counteracting this force is the shear strength of the bolts and the stud materials. The effective force on the bolts and studs is based on where the weight load is in relationship to the bolts and studs. If the weight were exactly centered between the bolts and studs, the effective weight would be divided between each stud and vertical pair of bolts and be halved (43 lbs on each). If the weight were totally on one end and there were a middle set of bolts and a set of bolts on the opposite end, the weight on the middle set could be increased to the full load of the TV (86 lbs downward) and the pressure on the bolts at the opposite end of the mount would be the load of the TV, but upwards. Any serious lag bolts 1/4" or more, and stud should have no problem handling that shear force. 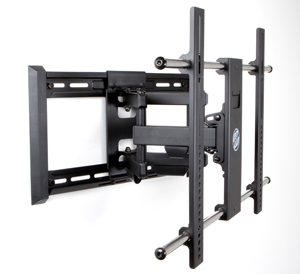 If you were to have the middle bolts further away from the TV than the center of the mount, you start to get leverage forces that could multiply the strain on the bolts and studs that might compromise their ability to hold the TV in a stable position. The likely weak points would eventually be the threaded holes in the studs rather than the bolts. You could also see a pulling of the TV and its mount out of horizontal. In sum, so long as you do not compromise the integrity of the mount and have the mount holes separated by at least half the width of the mount, you will probably be fine. BUT, once again, I would urge the selection of a mount with a wider range of mounting choices to benefit from its full width for support. SOME ADDITIONAL COMMENTS: The vast majority of TV mounts in general are only intended to span two studs. Additionally, if you are willing to add a bit of depth, you could attach the mount to a 1x6 board (or a strip of 3/4" plywood) using nuts, bolts and fender washers through the existing holes, and then mount the board or strip to two or even three studs with lag bolts. The Original Poster has now added information that this is a full motion mount. Because of the outward hinge aspect, these mounts almost always have one vertical pivot line in which all of the weight is concentrated. This makes the entire unit prone to horizontal twist forces and lateral tension forces (outward), not just shear forces. This also makes it more important to spread out the load, either with a new mount that has more mounting hole choices or using a bracing board that is then mounted to the studs. It also calls for deeply embedded lag bolts (at least 2" in the stud). There are some full motion mounts that can accommodate 70 inch sets, have multiple horizontal slots and even allow some horizontal adjustment. But they are much pricier than basic mounts. Links and images are for illustration only and are not endorsements of goods sources. Not the answer you're looking for? Browse other questions tagged walls mounting studs or ask your own question. What are these holes in my concrete wall and how can I mount things to them? Why does a wall in my finished basement only have a steel plate and no studs? How can I center a TV on a wall with a centered stud? TV mount is 16.5“ wide but stud centers are 17” apart. Is it still safe to mount? Can I mount wall 75 inches (50kg) tv on plasterboard? Using a full motion single stud wall mount for the 49” Sony 900f? Drilling a hole in a dry-wall backed by concrete or plaster?